I've talked about my love for baking powder biscuits before. They are a great little side dish and D just loves helping me to make them. Given that it's currently wild garlic season and Abel and Cole sent me some free wild garlic. My first thought was to see how they went in one of my favourite recipes. ... and then we ate them all before I had a chance to photograph them... so I just had to make them again... which was actually a good thing as I found them a little small and dry the first time around. Sadly, the right size of cutter has disappeared in the move (or might be in my Uncle's garage), so I need to get a new one. We made use of crumpet rings instead. Not so sharp though and perhaps a little big. Tasty though. Definitely tasty. Also good split with butter. An excellent side for Italian dishes. Preheat the oven to gas mark 8/230 degrees centigrade. Sift the flour into a bowl and combine the rest of the dry ingredients. Finely shred the wild garlic and add this to the flour mixture. Add the butter, rubbing together with the flour until you are left with something resembling breadcrumbs. Add the milk and mix with the dry ingredients and make a sticky dough. Flour a work surface and roll out to two centimetres thick. Fold one third of the dough over the middle third and then the other third over the top. Roll again to about 5cm thick. 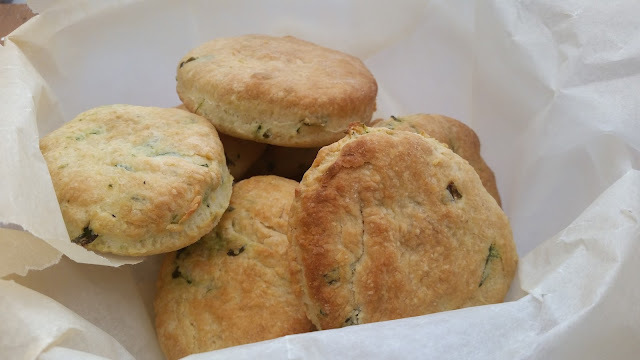 Flour your cutter and cut biscuits out, trying to get as many as possible from the dough. Then re-ball, re-fold and re-roll, until you are left with one final misshapen one. Line a tray with baking paper and put the biscuits on top. Put in the oven for twelve to fifteen minutes until golden brown. Remove from the oven and cool on a wire rack. 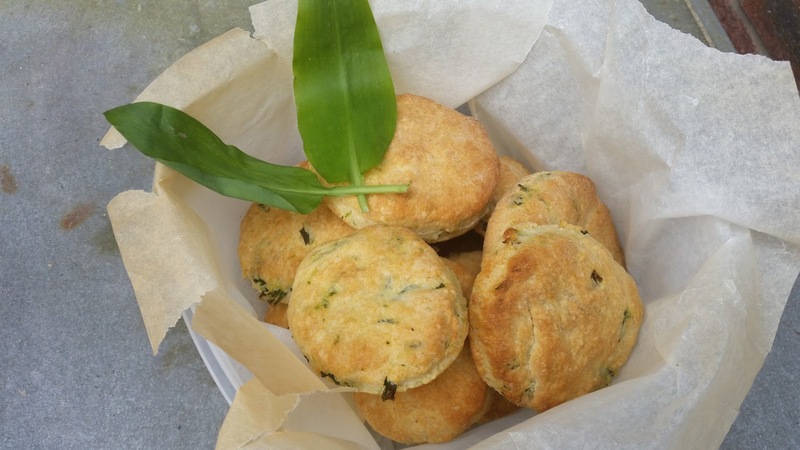 Looking for other ways to use wild garlic? 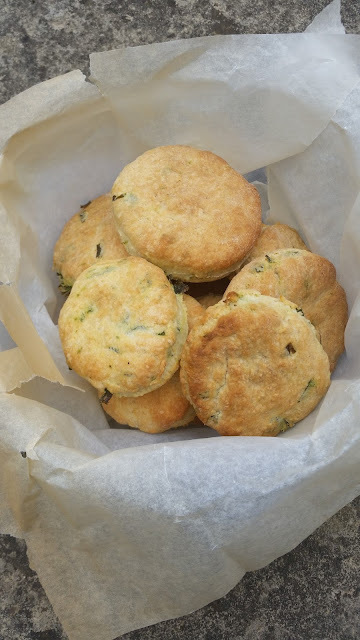 Wild garlic tattie scones from Foodie Quine are part of my inspiration for this recipe if I'm honest. They look great! Sweet potato and wild garlic soup from Munchies and Munchkins is a completely different way to use wild garlic.